Remember – our parks are natural and there could be areas that you don’t want your dog to get into. Some off-trail areas may have poisonous plants and dangerous wildlife, such as skunks and porcupines. 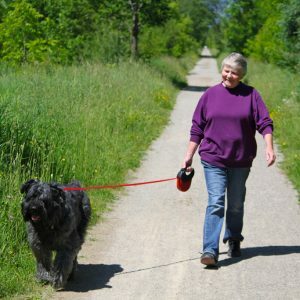 If you plan to bring your dog to the park, please keep them on a leash of six feet or less at all times. This is for their safety, and it also shows consideration for other park visitors who may be afraid of wondering dogs. Our parks are also home to species-at-risk. These species can be in danger when dogs are loose. We want everyone to enjoy our parks, so bring your furry friend and enjoy a day in nature with the family. Oh – and don’t forget to pick up after Fido.